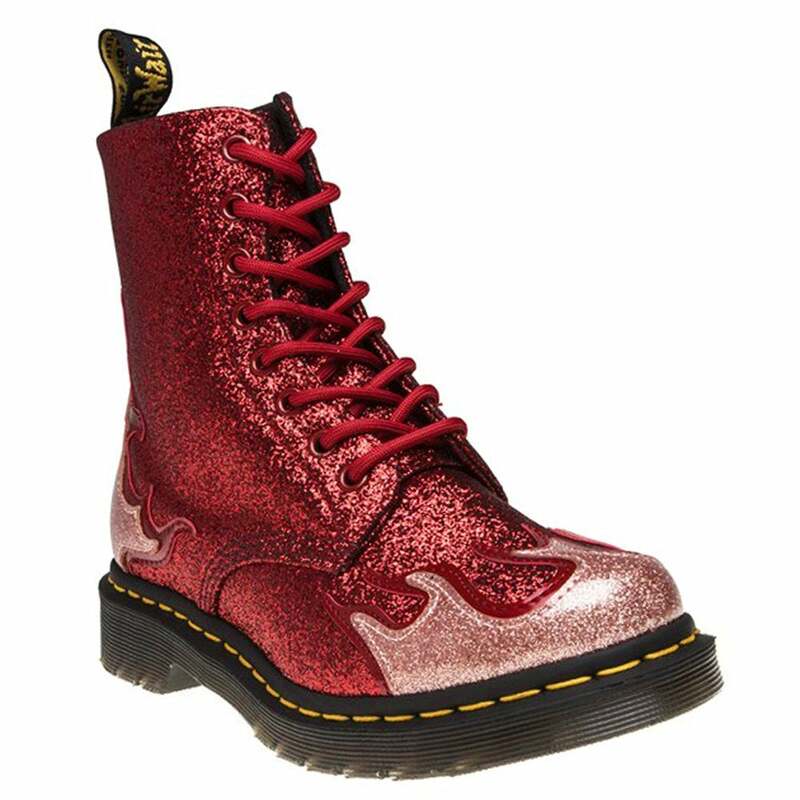 The Dr Martens Pascal is instantly recognisable and this season, the boot comes in a party-ready, high-shine coated glitter with a rock and roll-inspired flame design. Made with a mix of Glitter, a hardwearing material coated in high-shine, textured and super-sparkly glitter, and Coated Glitter, a synthetic material with a super-sparkly glitter finish with a clear coating to prevent glitter loss. An eight-eyelet metal ringed lace-up climbs its way up the front over a soft, flexible tongue, fastened with rounded red laces. Inside, the Pascal womens ankle boot is textile lined with a padded insole for your comfort, while its original Dr Martens air-cushioned sole is not just Goodyear welted but has Dr Martens iconic yellow Z-welt stitching, which together with a heat-sealing process makes the Pascal womens eight eyelet ankle boot unique to Dr Martens. The quintessential design of the eight-eyelet leather boot is as popular as ever thanks to its versatility and powerful statement - perfect for the woman who is looking for both fashion and function; the Dr Martens Pascal leather ankle boot is both distinctive and stylish, while offering uncompromising comfort.